David Short is my guest this time. We had an interesting time talking. I hope you enjoy the interview. Tom: David, you are best known for Ground Floor from TMG. Catch us up on it. David: Ground Floor released a little over a year ago. Since then, it has been played around the world, garnered praise from a variety of reviewers, used as “research” in business school, and grasped a high-ranking on BGG. More importantly, it appears to have brought enjoyment to people that have placed it on their table, which was the whole point. And that makes me proud. Currently, I’m working on an expansion for it called Middle Management. It adds a new employee called Manager, new improvements, new specialties and a new building to interact with on the board. 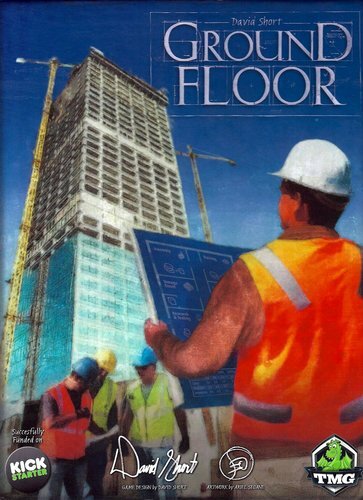 Tom: I played a prototype version of Ground Floor and thought it was pretty good. Very thinky. Tell us about the game. How does the game work? 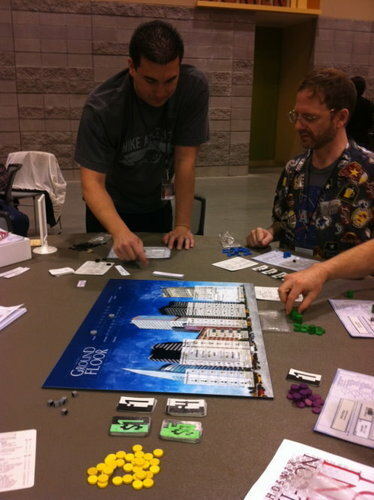 David: Ground Floor is a worker placement game about starting your own business. In this instance though, the “workers” that you’re placing aren’t workers at all, but actually time that you’re allocating to your business. You may spend time working at your home office, or spend time conducting business with others around the city. The key to the game is budgeting your allotted time while trying to acquire the two main currencies: money and information. Most actions in the game cost a mixture of all three: time, money and information. Of course, this must be done while adjusting your company to the volatile economic climate. It ebbs and flows just like real life. For this reason, it’s one of the rare worker placement games where more “workers” is not always the best path to victory. For example, you wouldn’t want to expand during a depression, but rather wait till a boom in the economy to price your product high and rake in the profits. Knowing when to hire and expand, versus streamline and consolidate, is part of the fun. The player interaction is tight, because the effectiveness of most actions relies heavily upon the moves of the other players. Reacting to the other players’ businesses and the economy leads to success. Additionally, the replayability is high, due to the varied economy and the individual specialty each player starts with in the game. Tom: GF got good press and has a rank of 7.29 on BGG. That’s quite nice. But while the game is a good strategy game, there is some criticism that it tends to be dry. Would you address that? David: Sure. Comments regarding the game being “dry” are usually directed to the theme – and theme is entirely subjective. Players gravitate to all kinds of themes. Who would have guessed farming would be big?! It’s odd. But it’s also why this board gaming hobby is great, because there is something for everyone. Many people love Ground Floor’s theme, because it’s unique and it provides an opportunity for them to fantasize about quitting their job and starting their own business. Who doesn’t dream about telling off their boss and going after something on their own? As far as the mechanisms being “dry”, I’m not sure what to say. I just don’t see it. I come from a deep love for games like Hansa Teutonica, Caylus, and Steam. There’s no sword fighting, spell casting or bomb explosions in those. Just brain burning decisions with high player interaction. I find that stuff very compelling and exciting. Tom: It’s a very good game. And you are correct. Hansa Teutonica is a fun game without explosions. Ground Floor was pretty successful on Kickstarter and one of the rewards was Skyline. Tell us about that game. David: Ground Floor’s kickstarter was a fun ride. Part of that success was due to including my dice game, Skyline, as a stretch goal. Skyline is a family game about constructing skyscrapers. Players roll dice that have sections of buildings on them. The dice stack up to create buildings in three sizes: low-rise, mid-rise and high-rise. The key to the game is that you have more control than the typical push-your-luck dice game, due to the ability to choose which dice you start each turn with. There are three types of buildings and three types of dice for each building. Do you play it safe or risk going big? It is currently available to play for free online with a superb implementation at Yucata.de. Come play me. Tom: I heard that you have a new game Planes. Tell us about it. 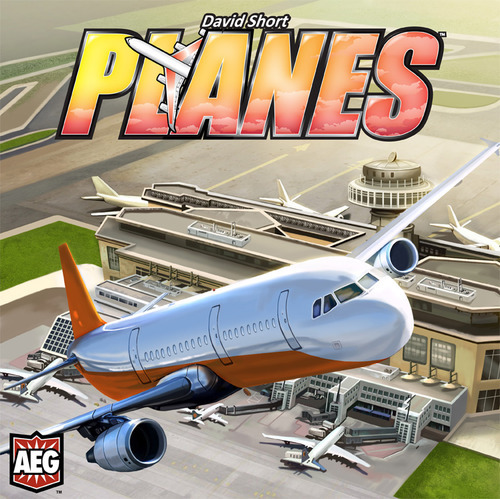 David: Planes is a game for 2-4 players about attempting to push your way through a crowded airport to reach your plane before takeoff. It utilizes a twisted iteration of the mancala mechanism, mixed with multi-use card combos and variable boards. It will debut at Essen later this year from AEG, and will join Trains in their Destination Fun line of games. Tom: Do you have a favorite design element/mechanic? David: Worker Placement is definitely my favorite large mechanism. I love it in games like Caylus, Stone Age and Tzolk’in. As far as specific smaller mechanisms, I’m a big fan of Rudiger Dorn’s chaining mechanism (as found in Goa), and Alan Moon’s pie cutting mechanism (as found in San Marco). One day I will make a game using pie cutting. Tom: I agree. The chaining mechanic in Goa is fantastic. Such a good, under-rated game. I’ve not played San Marco yet. David: San Marco is good. I used to like it a lot, but my recent plays of it have shown me that I’ve moved on a little in my tastes. Its cutthroat actions and die rolling really don’t appeal to me anymore. Tom: Theme or Mechanic. Which comes first for you?How do you marry mechanics and theme? Give an example if you don’t mind. David: I used to be all about theme first. But lately, I’m finding a balance between the two. My early games like Ground Floor, Skyline and Cluny Monks (unpublished), started with a theme and were driven by that theme. My last few games like Cypher, Planes and Bomb Squad, started with a challenge that led to a foundation, and then a theme was applied to that. However, even in those situations, the theme drove the project. I never move past early concepts without having a theme to lean on. I find it crucial. My background is in architecture – I wouldn’t design a building without knowing its site, its surroundings, its views and its intended use. I approach game design the same way. I can’t move forward merely on mechanisms alone. Tom: Do you have a design philosophy? David: I’ve never really thought about it. I like clean, streamlined games that allow specialization. But I don’t think that’s a philosophy. Tom: What are your design goals? David: The main goal, the one that drives me, is to have my games provide enjoyment for people from all backgrounds of life. I want my games to hit the table. If it sells a lot of copies, but stays on the shelf, that’s missing the mark. Tom: Lewis Pulsipher, over on his blog – , stated that “We’re obviously moving towards simpler and shorter games.” Would you agree or disagree with this? Why? David: I would agree. With the influx of micro games and copious gateway games, I believe this trend is here to stay. I think the reason for it is due to the continued board game revolution. Board games are being played by more and more people, in broader demographics, which inevitably means more people are being freshly introduced to the hobby. These newcomers often only have small windows of time and little prior experience with modern board games. This is why micro games and gateway games are perfect. Micro games are especially great, since I can carry them around with me just in case an opportunity arises. If the hobby continues to expand, which I believe it will, I see no end in sight for this trend of simpler and shorter games. Tom: Kickstarter – we’re several years in now. Is it hurting or helping gaming? David: I’m pretty torn on this issue. I’ve backed several products and some of my games have had campaigns on Kickstarter. I really like the service it provides, how it can bring attention to hidden gems, and I have enjoyed the outcome of many projects. However, some side effects have begun to surface that concern me. I’m not going to get into details here, my answer would be far too lengthy. That being said, overall I’m a fan and I think it’s good for board games, because it brings exposure and content to the hobby. Tom: You have two exciting somethings to talk about – Yardmaster Express AND Bomb Squad. Give us the download on them. 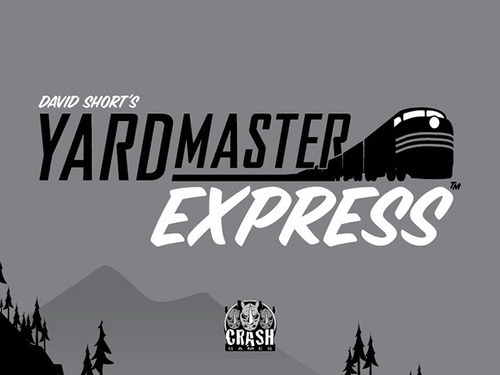 David: Currently I have my drafting micro game, Yardmaster Express, up on Kickstarter. It’s fully funded and progressing toward unlocking its 7th stretch goal. 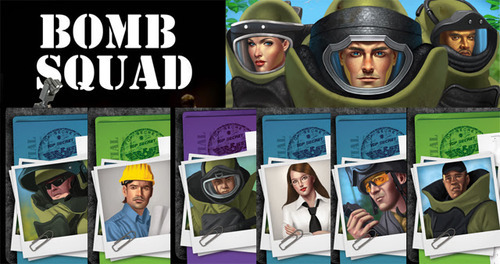 Later on this summer, August 1st specifically, my co-op game Bomb Squad will launch on Kickstarter. Very exciting. Tom: Yardmaster Express is from Crash Games and will probably be confused with Yardmaster. What is the difference? David: I was the lead devleoper on Yardmaster. My love for it inspired my design for Yardmaster Express. They share the same theme and art palette, but are different games. The original is a set collection game, while my Yardmaster Express (YmEx) is a drafting game. In YmEx, there is a communal hand of cards that get passed around the players. Each turn, you add a card to the hand and then draft a card to add to your train. The key is balancing the need to progress your own train, while also trying to deny your opponents good cards that they need. It plays in under 10 minutes and is very accessible to all demographics. Tom: That sounds really neat. Now talk about Bomb Squad. That’s from Tasty Minstrel right? David: Yes, Bomb Squad is being published by TMG and they will have it up on Kickstarter in August. Bomb Squad is a real-time cooperative game that uses the popular mechanism found in Hanabi. Players are a bomb squad team called in to save hostages and disarm bombs. Each player has a hand of cards, but must be given intel during the game in order to know what to do with them. There’s a timer for the bombs and the team must complete their mission before everything goes boom! We are very excited for everyone to see it. Tom: What’s your favorite unpublished game right now or maybe who is your favorite game designer at the moment? David: My favorite unpublished game right now is Pandemic: The Cure. It’s the dice game based on Pandemic and will be coming out later this year. I played it at BGG.con last year and it was a blast. I honestly wonder if I’ll ever play the board game again once The Cure comes out. My favorite game designer is Antoine Bauza. I love several things about his designs. First, I like how it’s difficult to pin down what kind of designer he is. He dabbles in several mechanisms, themes and demographics. Very versatile. Second, his designs are always streamlined. So clean. Both of these characteristics are elements that I strive for in my designs. Tom: What are you currently playing the most? David: I’m spoiled in that I regularly have opportunities to play games. I know that not everyone does and I’m thankful that I do. My wife is very supportive of my hobby, and I’m surrounded by great friends and a good gaming community. Currently, I’m infatuated with games like Russian Railroads, Keyflower and Trains. Additionall y, games like Dominion, Skyline and Ticket to Ride continue to see time on my table, because my wife loves them (can’t argue with that). Tom: Russian Railroads is a very fun game. Worker placement bonanza. Very similar to The Manhattan Project which I enjoy a lot. What game surprised you and how? David: I’ll answer this from both a positive and a negative perspective. A game that I had high expectations for, but was surprised by its mediocrity, was Pantheon. Pantheon is designed by Bernd Brunnhofer (the same designer as my favorite game, Stone Age, and another game I like, St. Petersburg). On the pedigree of those games, plus the usual research I did, I had high expectations. Unfortunately, the game did not provide the quality of decision space I enjoy, and unfortunately it fell really flat. I did not see that coming. On the other hand, a game that I had little interest in after researching it, but was pleasantly surprised after playing, was Augustus. Many people, myself included, dismissed it for being based on the brainless bingo. While it is based on bingo, it supplements that foundation with some clever push-your-luck interaction and sweet card-combos. I highly recommend it as a light gateway game. Tom: Augustus is a good game and you are right. It is an excellent gateway game. Do you see any trends in the gaming industry that you would like to bring up? Microgames? More POD? Anything? David: I already commented on the recent popularity of micro games. The only other trend that comes to mind is the growth of the board game cafe. I love the concept behind these wonderful mashups of culture. Mixing the leisure activity of sitting and drinking a beverage, with the leisure activity of playing a board game, is a recipe for a good time. It’s a great combo that I hope continues to succeed. We need one in Tucson! Tom: What was the last good movie you saw? David: Captain Philips was fairly entertaining, but I’ll have to go all the way back to Inception for a movie that really impressed me. I love how following the storyline takes effort and attention to detail, but the movie rewards you for staying on the ride. Tom: How can people contact you? Are there any links you would like folks to visit? David: Thank you for having me. I really appreciate the chance to share with everyone. Thanks to David for taking time to talk with me. Please visit the Yardmaster Express Kickstarter. Please your comments below or send me an email.